White Pine Weevil (Pissodes strobi) is one of our sneakiest conifer pests found in Ohio. Females spend the winter out of sight cooling their six heels in the duff beneath their pine or spruce targets. As temperatures warm in the spring, they climb their hosts to feed and lay eggs in the terminals. Sap oozing from small holes in the terminals is a calling card of this weevil. This native weevil has a wide conifer host range that includes Scotch, jack, red, pitch, and eastern white pines as well as Douglas-fir and all spruces. Indeed, the weevil's love of spruce is exemplified by its alternate common name, Engelmann Spruce Weevil, or simply Spruce Weevil. White pine weevil is not just found in Ohio; it ranges from the east coast west into the Rockies. Overwintered female emergence commences when the accumulated Growing Degree Days (GDD) reach 84. This roughly coincides with the full bloom of Northern Lights Forsythia (Forsythia x intermedia), Speckled Alder (Alnus incana), and Cornelian Cherry Dogwood (Cornus mas). Although we've surpassed the magic GDD number of 84 in southern Ohio, and I've taken some wonderful pictures of Cornelian Cherry blooms, it doesn't mean all is lost. The roller coaster pattern of our spring temperatures mean that we keep hitting the pause button on weevil activity. Of course, the clock is ticking with executing the first suppression tool for the season: applying a "borer spray" to protect conifer terminals against this weevil. Females use their chewing mouthparts located at the tip of their long snout (rostrum) to chew small holes through the bark to feed on the sugar and nutrient rich phloem. Eventually, they turn around and deposit an egg in some of these holes. Targeting the terminals with an insecticide to kill the females will prevent the egg laying activity. Effective products include those based on the active ingredients bifenthrin (e.g. Onyx), permethrin (e.g. Astro), or cyfluthrin (e.g. Tempo). A second application may be required depending on spring weather conditions and product label recommendations. If females are successful with laying eggs, the resulting white, legless, slightly curved, grub-like larvae tunnel downward side-by-side just beneath the bark feeding on the phloem. The larvae will eventually construct so-called "chip cocoons" in which they pupate. Infested leaders wilt, turn brown, and die. Dead leaders occurring in mid-summer which sometimes have a curved "shepherd's crook" appearance is another calling card of this weevil. New adults emerge from the infested terminals late in the season to feed and mate. Females of this second generation then crawl to the duff to spend the winter in preparation for sneaking up on us the following spring. Removing and destroying infested terminals prior to adult emergence is the second suppression tool for reducing weevil populations. I'll post a "how to" on this method later this season. The weevils are capable of killing small trees less than 3' in height, but it does not kill large trees. However, years of successive damage to terminal leaders will eventually create "cabbage trees" which are short, squat trees with multiple terminal leaders in landscapes and woodlots. Of course, loss of the leaders presents a serious production problem in nurseries and Christmas tree plantations. The third weevil management strategy is to make preventative systemic insecticide applications in the fall that target the weevils as they feed on the phloem the following spring. The systemics will also kill early instar larvae as they begin tunneling in the phloem but before they produce serious damage. Systemics such as imidacloprid (e.g. Merit, Nuprid 1.6F, etc.) may be applied using soil drench or soil injection applications. 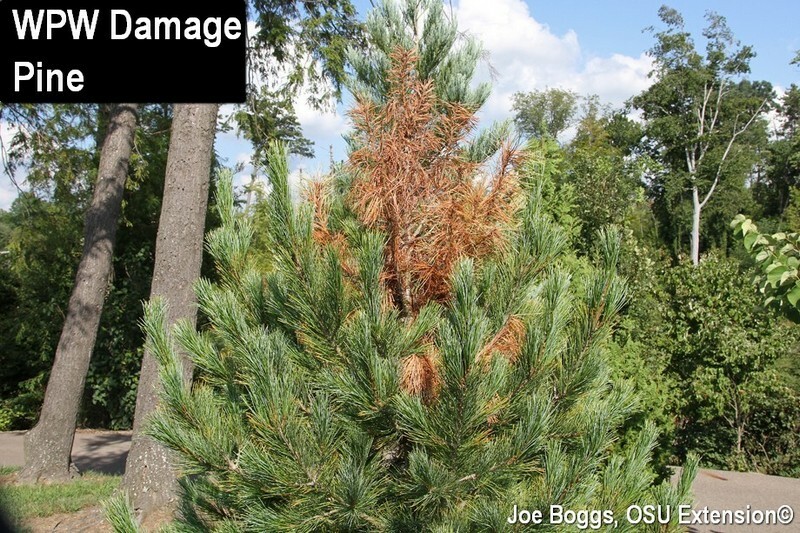 Of course, this preventative control measure should be reserved for landscapes, nurseries, or Christmas tree plantations that have a history of significant white pine weevil activity.